Find out how to earn this powerful Exotic weapon from the original Destiny. Destiny 2’s plethora of earnable Exotics includes a mix of both brand new weapons and armor and old favorites from the original Destiny, and few are more coveted right now than the MIDA Multi-Tool Exotic Scout Rifle. 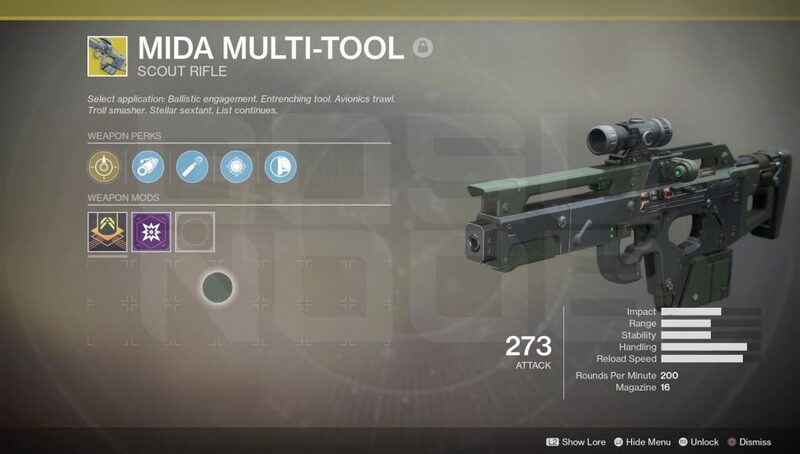 Fortunately, unlike most other Exotics in Destiny 2, there’s a guaranteed path towards securing your own MIDA Multi-Tool, and we’ve got the lowdown on all the legwork you’ll have to put in. Below, we outline the steps required to get the MIDA Multi-Tool in Destiny 2. You’ve reached the maximum Guardian level of 20. You have beaten the main story campaign. You have a power level of at least 260 (the closer to 270 the better). You have a decent Scout Rifle on hand, and you also have a few others stowed away in your vault. To get the MIDA Mini-Tool in Destiny 2, you'll need to find a special quest marker near Devrim Kay's church. 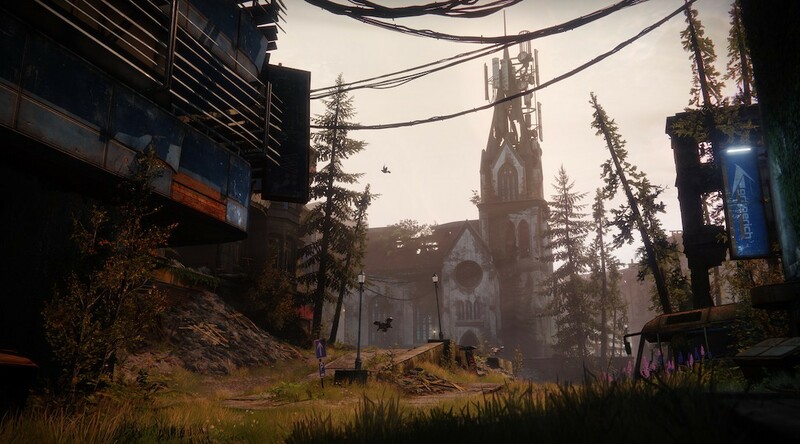 Once the criteria listed above has been met, head over to the European Dead Zone and look for a special quest marker near Devrim Kay’s church called “Enhance!” Note that the recommended starting power level for the quest is 260. Kill 50 enemies using precision shots from a Scout Rifle. Kill 25 enemies with a Scout Rifle without reloading. The above two objectives is where having a decent Scout Rifle definitely comes in handy. Once you’ve completed those first two objectives, return to Banshee-44 and he’ll ask you to dismantle five different Scout Rifles of either Rare or Legendary quality. With that done, he’ll give you one final quest called “The Fall Will Kill You” which tasks you with earning 50 kills with a Sub-Machine Gun while airborne (the intended idea being that you’ll use the MIDA Mini-Tool). By completing The Fall Will Kill You, you'll be able to earn your MIDA Multi-Tool in Destiny 2. Once you complete The Fall Will Kill You and return to Banshee-44 one last time, he’ll award you the MIDA Multi-Tool. 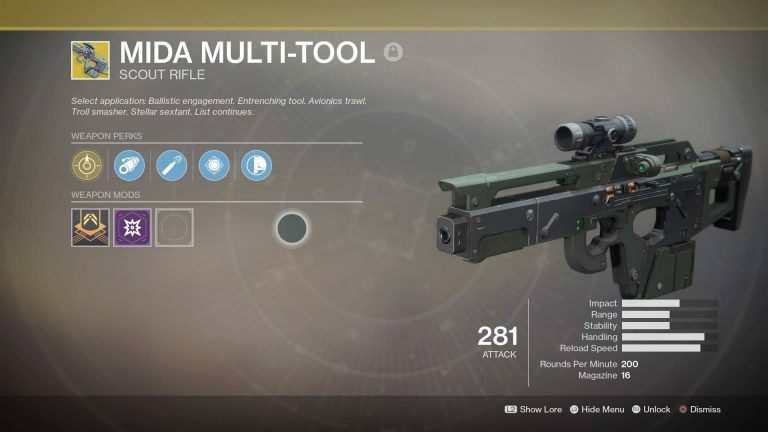 Both the MIDA Multi-Tool and MIDA Mini-Tool are powerful guns in their own right. In fact, they even have special properties that can only be activated when you have both weapons equipped at once. As such, make sure you use infusion to ensure their damage values remain competitive.